You want to look your best, but maybe you're hesitant at the thought of going under the knife. Getting rid of stubborn wrinkles and fine lines seem impossible without surgery, but that is not the case. More people are looking into nonsurgical facelifts in Las Vegas. Americans in 2016 underwent 17.1 million cosmetic procedures, with 15.4 million being procedures that were minimally invasive, or nonsurgical. Celebrities are even joining in the on the nonsurgical facelift hype, with Kim Kardashian being one of them. Nonsurgical facelifts can reverse the effects of aging. Surgical facelift procedures are no longer the only way to reduce your wrinkles. In fact, nonsurgical facelifts can have the same results as a surgical procedure, while providing you with a more comfortable experience. With nonsurgical procedures, you don't need to be hospitalized after the procedure and you won't need any large incisions. Instead, you can receive your treatment in the comfort of your doctor's office and walk out feeling refreshed. You'll get all the same benefits of a surgical facelift but without the extensive recovery time. Depending on which nonsurgical facelift procedure you choose, it can restore your youthful appearance by giving your face a fuller appearance without the wrinkles or sagging that come along with aging. There are a variety of options for facelifts without surgery in Las Vegas, all of which will make you walk out of your doctor's office feeling beautiful. If you aren't a fan of one nonsurgical facelift procedure, there are plenty of more options to choose from. These are the most common procedures, all of which can be done in just one day. Botox injections are one of the most popular nonsurgical facelift treatments. Unbelievably, 4,250,000 Botox procedures were performed in the United States in 2015. Botox injections work by using a toxin called botulinum. It causes temporary muscle relaxation at the site of the injection. Because your muscle is relaxed, it can't move to cause a wrinkle. Your doctor will inject a very small amount of the botulinum toxin into an area of your skin. The process takes just a few minutes to complete. If you want to make your fine lines, eyebrow wrinkles, forehead wrinkles, and crow's feet disappear, consider using Botox. You'll be wrinkle-free in three to seven days following your treatment. The effects of Botox will last for three to four months, so you'll have to continually visit your doctor to keep your face looking great. Thermage is a low-maintenance nonsurgical procedure, as you only need to repeat treatment every two to three years. Better yet, it's completely painless and needle-free. With the use of radiofrequency technology, you can get smooth and tight skin. Fine lines, wrinkles, sagging brows, cheeks, and jaws are treated using Thermage. Only 20 minutes in your doctor's office can give you immediate results. Your doctor will use a handheld device that heats each area of your skin. During your treatment, you'll only feel heat on your face, but it shouldn't hurt. However, a high-intensity treatment may cause only a little bit of pain. The heat promotes collagen growth in your skin. Because your skin will be continually generating more collagen, you'll be able to see more improvements to your skin over time. Using light is a pain-free and needle-free method of getting a facelift. Light Emitting Diode (LED) therapy, works to rid your skin of many flaws from acne, pigmentation, scarring, rosacea, fine lines and wrinkles. Some LED facials use different technology than others, but the basic concept remains the same: shining different colored lights on your face results in different reactions from your skin. You can use blue light to kill acne-causing bacteria, while red light can be used to tighten your face, as well as stimulate collagen growth. Like the other nonsurgical treatments, LED therapy requires no recovery time. It does, however, take at least 24 sessions to see any improvements in your skin. If you want to see results fast, consider undergoing Intense Pulsed Light (IPL) therapy. A spectrum of wavelengths is shone on your face from a broadband light, reducing the appearance of pigmentation, sun damage, and red vessels. Unlike LED therapy, the results of IPL therapy can be seen after six treatments. As you age, your face will begin to sag and wrinkle. Using facelift tape is a quick and easy method to temporarily combat the effects of aging. It's especially effective for the areas around your jaw and cheekbones. All you need to do is stick two pieces of high-quality, invisible tape on your cheeks on both sides of your face. The adjustable elastic band that's connected to the tape is used to lift your skin up, making your wrinkles vanish and your skin become firm. Don't worry about anyone seeing your tape--it can usually be hidden underneath your hair and behind your ears. 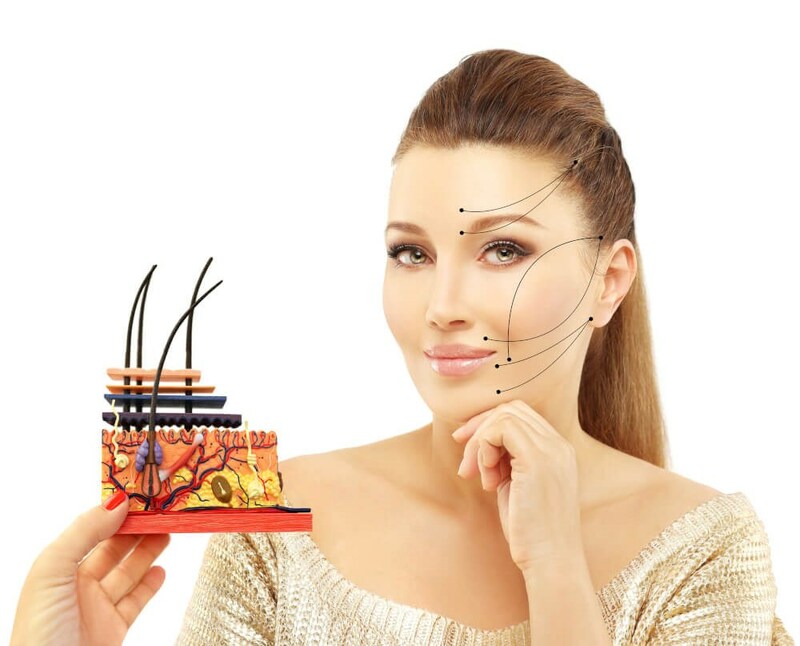 If you're looking for a way to avoid surgery and needles, facelift tape is a great method to try. Don't be scared off by the name of this nonsurgical facelift. During this procedure, blood will be drawn from one area of your body. Platelets are extracted from the blood and infused with hyaluronic acid fillers. Your doctor will then inject the blood into your face. The Platelet Rich Plasma (PRP) in the injection works to enhance blood flow, as well as promote stem cell growth in your face. Your skin will look and feel rejuvenated. Say goodbye to having a long recovery time after surgery--no more worrying about knives, incisions, or pain. Instead, you can opt for a painless nonsurgical procedure that will have you home on the same day. Who can say no to one of these simple procedures that will leave your skin tighter, firmer, and with less fine lines and wrinkles? If you're looking for a nonsurgical facelift in Las Vegas, feel free to contact us for a consultation or appointment.